Internal derangement is an abnormality in the position of the articular disc relative to the condylar head resulting in mechanical interference with the normal joint dynamics. Anterior (pure anterior, antero-medial, or antero-lateral) disc displacement is the most common type of internal derangement. 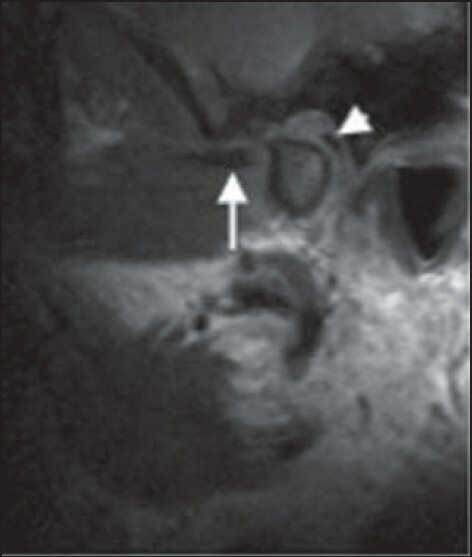 , Posterior disc displacement does occur, but it is rare [Figure 2]. The combination of anterior and lateral or medial displacement is called rotational displacement, whereas pure lateral or pure medial displacement is called sideways displacement. 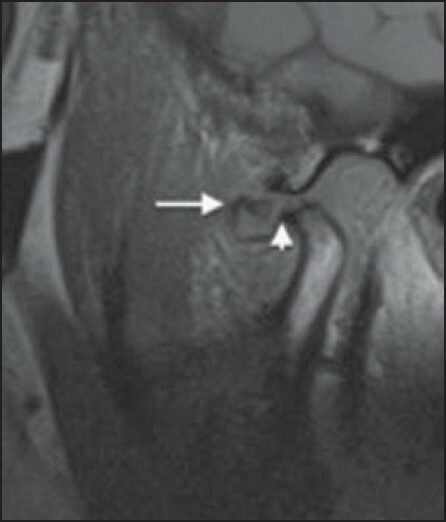 ,, When the disc is anteriorly displaced in the closed-mouth position but reduces (returns) to a normal position during opening, it is called anterior disc displacement with reduction (ADDwR) [Figure 3]. 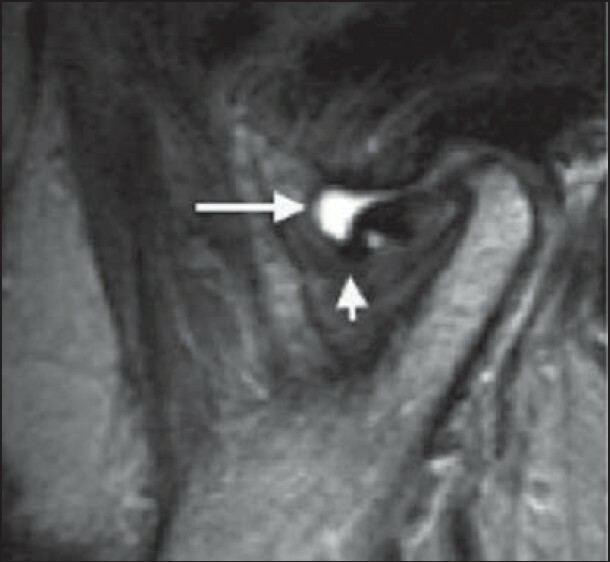 However, when the disc is persistently anteriorly placed regardless of the condyle position, it is called anterior disc displacement without reduction (ADDw/oR) [Figure 4]. In ADDwR, when an anteriorly displaced disc returns to a normal position, a click is usually heard during the opening. When the jaw closes, the disc again displaces anteriorly, usually during the last phase of the closing movement of the jaw and again a click is commonly heard. The closing click is usually less prominent than the opening click. The clicking sound is caused by the impact of the condyle hitting the temporal eminence after the condyle has passed under the posterior band of the disc. , ADDw/oR is usually associated with joint locking (limited mouth opening). This occurs when the condyle is located behind the thick posterior band of the disc and the whole disc is bunched up anteriorly. Hence, a click usually indicates an ADDwR. A lock usually indicates ADDw/oR. Thus, a clicking joint does not lock and a locking joint does not click, at the same time. 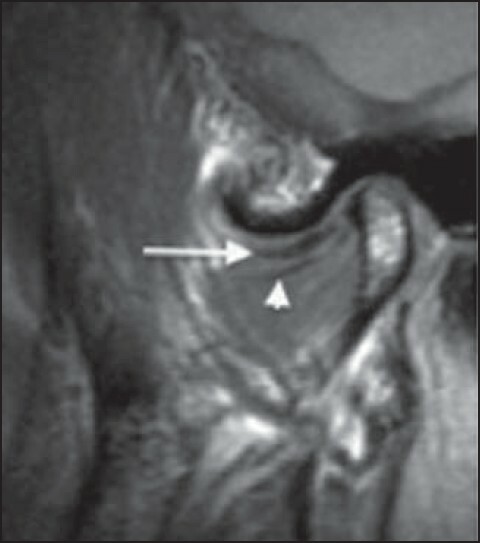 The standard magnetic resonance imaging (MRI) protocol of TMJ includes oblique sagittal and oblique coronal images perpendicular and parallel to the long axis of the condylar head. Sagittal images should be obtained in both closed- and open-mouth positions to determine the disc dynamics. Coronal images are usually obtained only in the closed-mouth position. 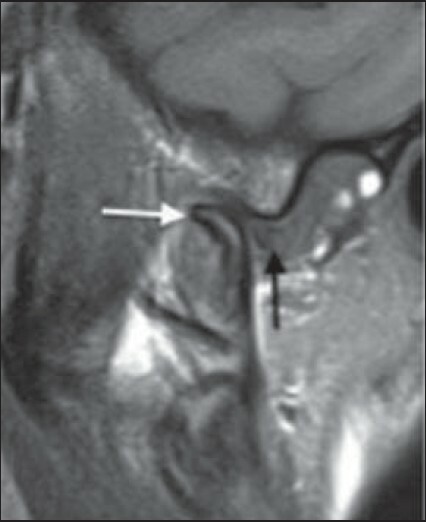 Figure 6: Sagittal T1-weighted magnetic resonance image in closed-mouth position shows anteriorly displaced articular disc (arrow) and a hypointense band in the retrodiscal region (arrowhead) indicating thickening of posterior discal attachment "pseudo disc sign"
Figure 7: Sagittal T1-weighted magnetic resonance image in closed-mouth position shows anteriorly displaced disc (arrow). 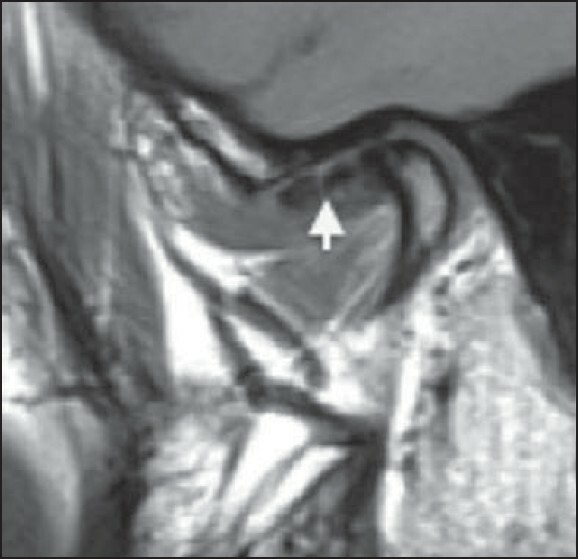 Note the low signal intensity of lateral pterygoid tendon is parallel to the disc, giving a "double disc sign"
Effusion is accumulation of excessive amount of fluid (usually inflammatory exudate) in the joint cavities. It is considered to be an early sign that may precede degenerative joint disease. 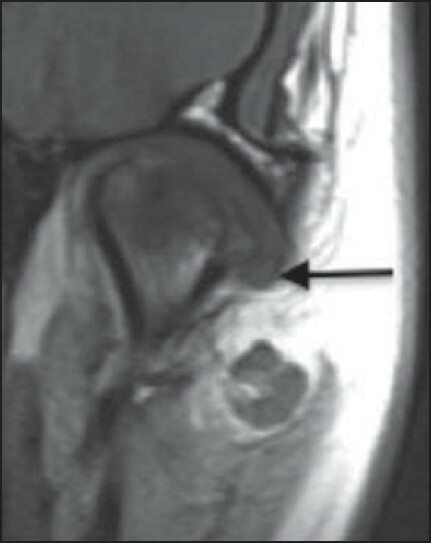 Joint effusion is best depicted on T2-weighted MRI as high-signal intensity areas in the joint spaces [Figure 8] and [Figure 9]. 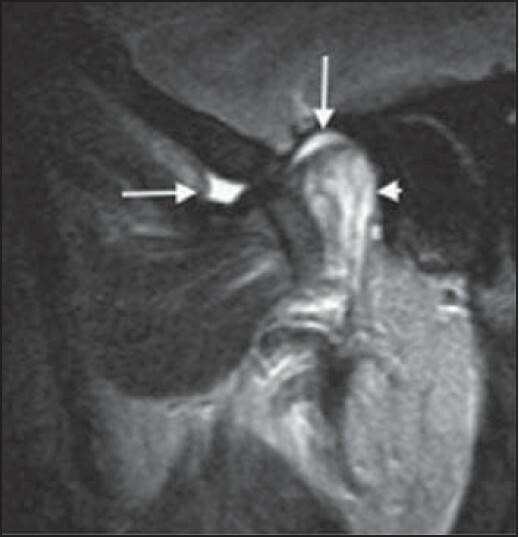 Due to the arthrographic effect created by the high signal intensity of the joint effusion on T2-weighted images, these images also may be useful for outlining disc perforations  [Figure 10]. 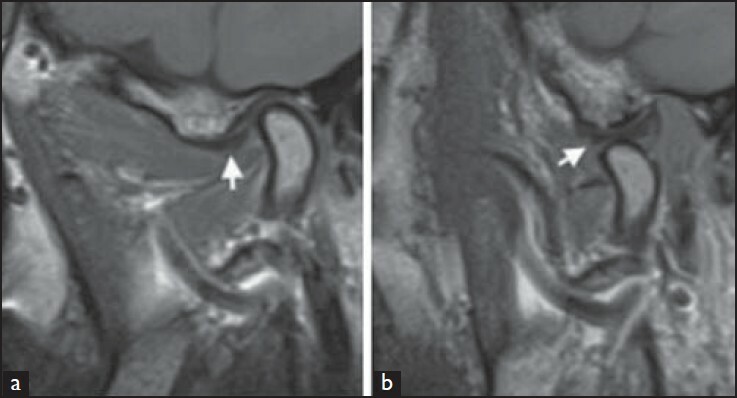 Other MRI observations associated with internal derangement include hypertrophy of lateral pterygoid muscle [Figure 11], rupture of retrodiscal ligaments, joint effusion and bone marrow edema of condylar head [Figure 12]. 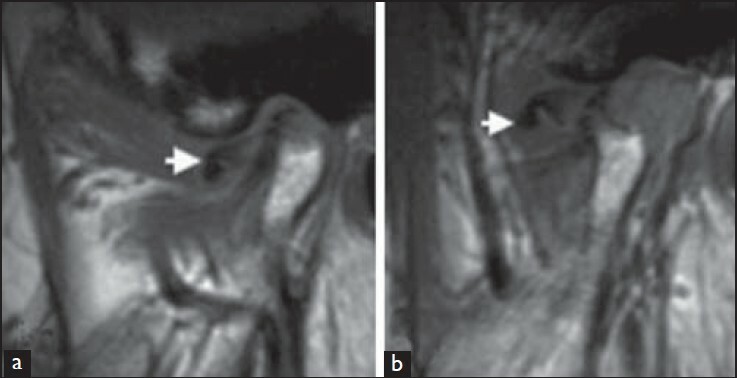 It is important for the radiologist to detect early MRI changes of TMJ that may proceed to advanced osteoarthritic changes [Figure 13]. 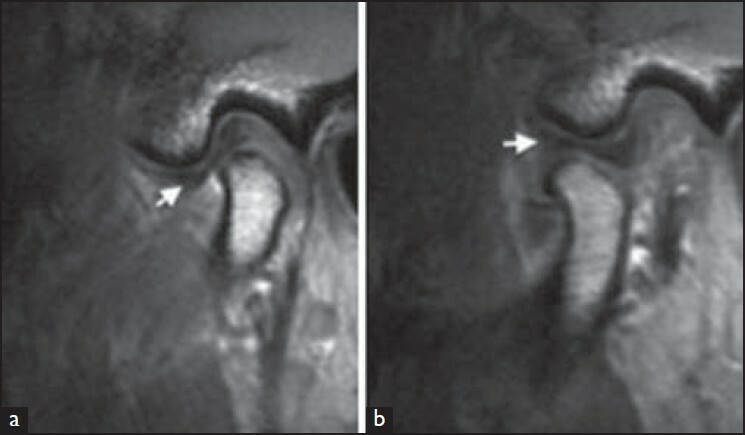 In this article, we highlight MRI findings of soft-tissue abnormalities of TMJ and feel it will be of interest and aid learning for both radiology trainees and practitioners. This article should be a useful reference for maxillofacial radiologists and orofacial pain specialists as knowledge of disc abnormalities of TMJ is important for optimal patient care. 1. Sinnatamby CS. Last's Anatomy: Regional and Applied. 12 th ed. London: Churchill Livingstone; 2011. p. 411-3. 2. Adams JC, Hamblen DL. Outline of Orthopedics. 13 th ed. London: Churchill Livingstone; 2001. p. 135. 3. Eriksson L, Westesson PL. Clinical and radiological study of patients with anterior disc displacement of the temporomandibular joint. Swed Dent J 1983;7:55-64. 4. Wilkes CH. Internal derangements of the temporomandibular joint. Pathological variations. Arch Otolaryngol Head Neck Surg 1989;115:469-77. 5. Liedberg J, Westesson PL. Sideways position of the temporomandibular joint disk: Coronal cryosectioning of fresh autopsy specimens. Oral Surg Oral Med Oral Pathol 1988;66:644-9. 6. Katzberg RW, Westesson PL, Tallents RH, Anderson R, Kurita K, Manzione JV Jr, et al. Temporomandibular joint: MR assessment of rotational and sideways disk displacements. Radiology 1988;169:741-8. 7. Liedberg J, Westesson PL, Kurita K. Sideways and rotational displacement of the temporomandibular joint disk: Diagnosis by arthrography and correlation to cryosectional morphology. Oral Surg Oral Med Oral Pathol 1990;69:757-63. 8. Isberg-Holm AM, Westesson PL. Movement of disc and condyle in temporomandibular joints with clicking. An arthrographic and cineradiographic study on autopsy specimens. Acta Odontol Scand 1982;40:151-64. 9. Isberg-Holm AM, Westesson PL. Movement of disc and condyle in temporomandibular joints with and without clicking. A high-speed cinematographic and dissection study on autopsy specimens. Acta Odontol Scand 1982;40:165-77. 10. Kaya K, Dulgeroglu D, Unsal-Delialioglu S, Babadag M, Tacal T, Barlak A, et al. Diagnostic value of ultrasonography in the evaluation of the temporomandibular joint anterior disc displacement. J Craniomaxillofac Surg 2010;38:391-5. 11. Wang EY, Fleisher KA. 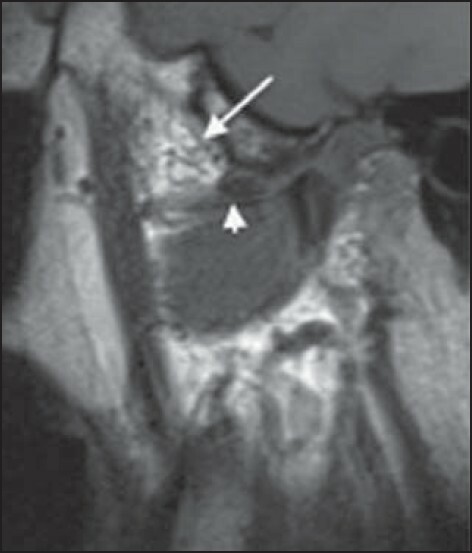 MRI of temporomandibular joint disorders. Appl Radiol 2008;37:17-25. 12. de Leeuw R. Orofacial Pain: Guidelines for Assessment, Diagnosis and Management. 4 th ed. Chicago: Quintessence; 2008. p. 142-58. 13. Tomas X, Pomes J, Berenguer J, Quinto L, Nicolau C, Mercader JM, et al. MR imaging of temporomandibular joint dysfunction: A pictorial review. Radiographics 2006;26:765-81.